President George Manneh Weah has urged Cabinet Minister to employ based on competence and not along party lines. President Weah made the statement March 11, 2018 during the 53rd birth anniversary of Ambassador Clar Marie Weah held at the Winner Chapel in Oldest Congo Town. He reminded his Cabinet to ensure employment is based on competence and not on party line since the government aims to bring change and not to continue on the old path. President Weah described the First Lady’s birthday as a special day in his life and a blessing especially celebrating with his wife on her natal day in a church. The Liberia leader said although he is not perfect however promised to do his best to be a people-centered President. He assured Liberians that he will prioritize the less fortunate in society and the wayward children known as “Zogos” to become useful citizens after a prolonged civil war in Liberia. He furthered that his wife was able to mentor him during the civil war by challenging him to reach out to the Liberians who were languishing in refugee’s camps across the sub-region by helping to bring relief to their shattered lives. 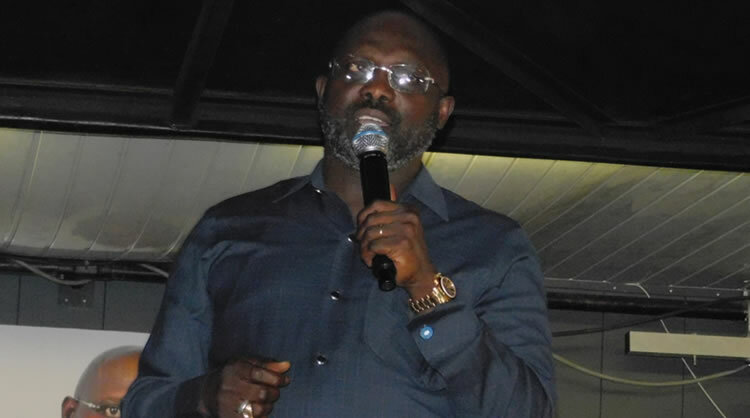 President Weah said - like his grand-mom and mom, the First Lady is an inspiration to him. Speaking, Ambassador Clar Weah thanked President George Manneh Weah for the opportunity afforded her to serve the Liberian people and promised to reach out to all in her power, by the grace of the Almighty. Earlier, Pastor Chidiebere Mibuko, of Winner’s Chapel cautioned the Liberian Leader to be steadfast in administering the affairs of the nation. Pastor Mibuko challenged President Weah not to be distracted but remain focused.